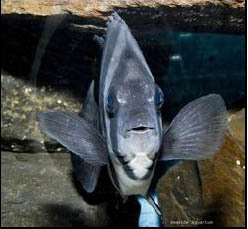 A new resident of the Seaside Aquarium traveled over four thousand miles to get here. It came by boat, but not in the care of any humans. Its journey across the Pacific Ocean as a stowaway very likely took two years. 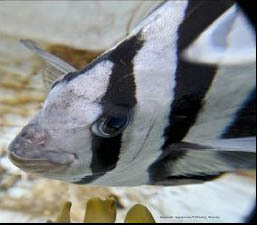 The fish in question is a striped beakfish (Oplegnathus fasciatus), also known as the barred knifejaw. It typically lives at depths from one to ten meters on coastal reefs in the waters of Japan, Korea, and Taiwan. 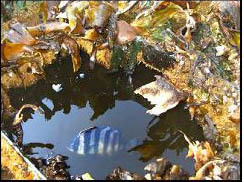 Juveniles reportedly associate with drifting seaweed. Exactly how and when this fish hitched a ride on a Japanese fishing boat, the Sai-Shou-Maru, is a mystery. The boat was marine debris from the 2011 Japan tsunami. On March 11, 2011 a 9.0 earthquake struck off Japan�s eastern coast. In less than an hour, a tsunami (tsoo-NAH-mee; a series of waves caused by an underwater quake, landslide or eruption) inundated over 217 square miles of Japan, destroying or damaging at least a million buildings. Roughly five million tons of debris were carried out to sea during the 2011 Japan tsunami. Although 70% of it sank, the other 1.5 million tons are still afloat in the Pacific Ocean. NOAA (the National Oceanic and Atmospheric Administration) predicted that marine debris would begin to arrive on Oregon coasts in the fall and winter of 2012-13 and would continue to wash up intermittently for years. 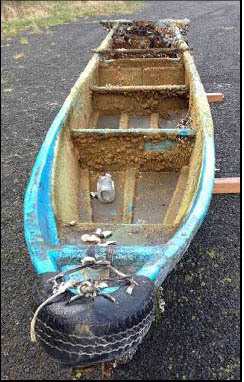 So far, boats, concrete docks, and smaller debris have been discovered on Oregon and Washington coasts. 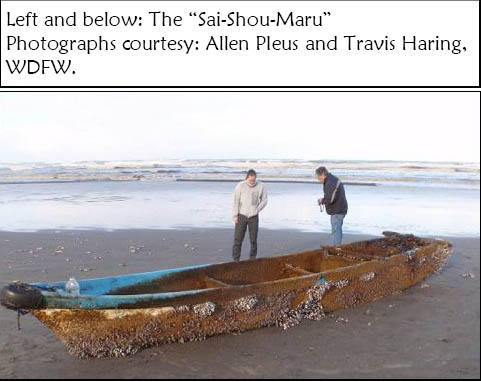 The Sai-Shou-Maru was discovered March 22, 2013 on the coast of Washington, almost exactly two years after the tsunami in Japan. The striped beakfish was safely nestled in the bait box of the 18 foot boat. The boat will be placed on display at the Columbia River Maritime Museum. The fish was transported to the Seaside Aquarium where it has developed an affinity for a local delicacy: razor clams. If you call 211, it is a general hotline for social services and health programs. Follow the prompts to report tsunami debris.